Every year Nepals brightest and most educated young people leave the country in search of a better future for their families. One of the poorest countries in the world, they take out mortgages against their families homes to finance their venture, often leading to severe stress and disconnection from their homes for many years sometimes up to 10 or more. Being a predominantly patriarchial society, often women are left home alone for years raising children, undoubtedly families lose traditions, culture and connection with each other. Unfortunately Nepalis don’t see that they have any choice, with a lack of industry and work opportunities they are desperate to make change. Education does not come easy in Nepal and if you make it to level 12 let alone get to University, you are one of the lucky ones. Education is expensive sometimes students have to trek more than 3 hours to get to school and in the winter season this is very hard. My husband remembers getting up with the sun to study as there was no electricity and that meant no lights to read. HOWEVER it is not all doomed, I see opportunity and possibility. I was holidaying in Nepal at the time of the 2015 Earthquake and spending a good portion of 2015 and some of 2016 in Nepal, I realised that there is hope to change this growing trend to leave their homes. Lonely Planet declared Nepal the best destination for Travel in 2017. Travel and Tourism is the biggest industry in the developed world, with more people travelling and having access to adventure everyday, spending 1000's of dollars. 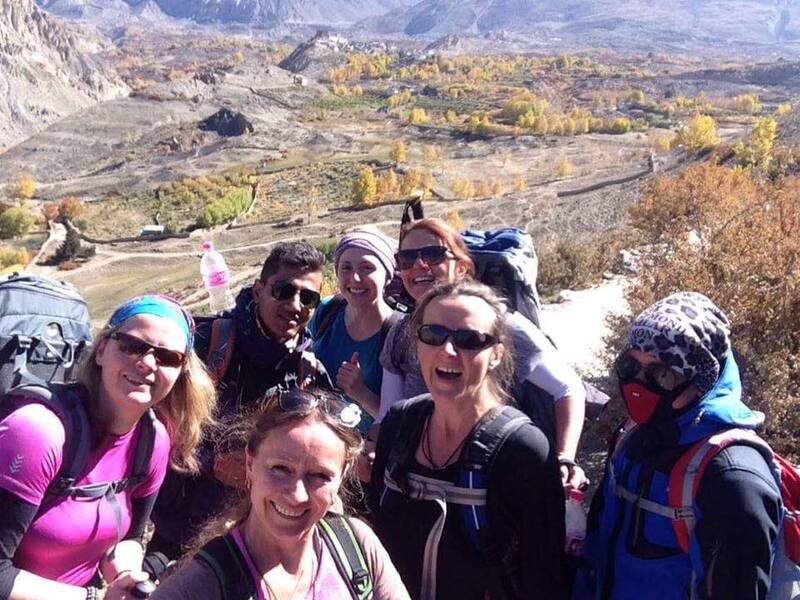 The Reconnection Tribe seeks to close this gap and reconnect families, reconnecting communities and each other through Eco Tourism and Education and adventures in Nepal. By combining tourism and education we seek to create opportunities to help Nepali people stay and work in their local communities. Creating sustainable tourism based businesses that benefit the whole village. Cross cultural exchange is important in developing Nepal, combined with a sustainable approach protecting their traditions and culture. To do this we need your help. Below is information that has come direct from one of the villages we support. Arnakot Deurali is located on a high, isolated plateau in western Nepal, four days’ walk from the nearest road. Our hardworking community has etched out a living from the abundant plateau soils for generations, but life in the community is incredibly hard. Each day is a fight for clean water, food for the family and medicines and care for the sick and elderly. With such things in short supply, the average Arnakot resident doesn’t live much beyond their 60s and education – a critically important factor in our community’s development – is often inaccessible or financially infeasible. RECENTLY; after dedication and hard work we installed Solar Panels to provide power to our local school and community. Due to landslides in the area they are now under threat and we need support to fix this situation. Most importantly, we need you to get involved! Contact us to find out how you can work with us to ensure a healthy future for our active mountain community. # Health funding to provide good education and minimise health issues. Education is still the number one tool to get people out of poverty. Karma Flights is registered as a not for profit with Nepali government. We believe that to change the world for the better and improve the quality of life of people in underdeveloped countries is through education. We can do this, one child, one dollar, one simple act of kindness, one gift at a time. For a child in a world where no one seems to care, the gift of education can change their lives in so many ways it is impossible to put a $$ value on it. Our commitment in this group is to support each other, the children and extended families in improving their lives through child sponsorship. No middle man, no administrative costs, no big corporations, just simple person to person support. Grassroots support. Thank you from the bottom of our hearts for your contribution. Currently we are focused on Nepal, however we are open to new projects as they come to hand. Please watch our video to see how your contributions make a difference. With the help of www.karmaflights.org and www.reconnectiontreks.org we can do our part. 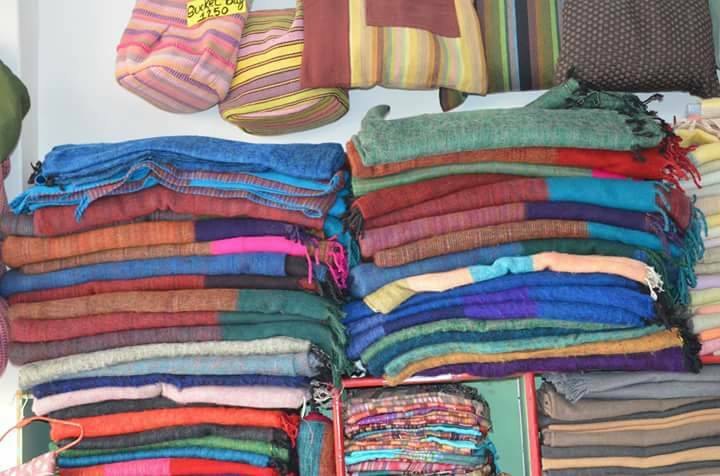 Buying Chetanas blankets, bags and other goods, gives jobs to Nepali women and provides them with independence in a society where there is no Welfare or support for women without an income or husbands. Your donations go towards training and providing materials to the women and this allow us to continue purchasing their goods. Our market stall in Australia. So off we go again on our next Trek to Nepal. 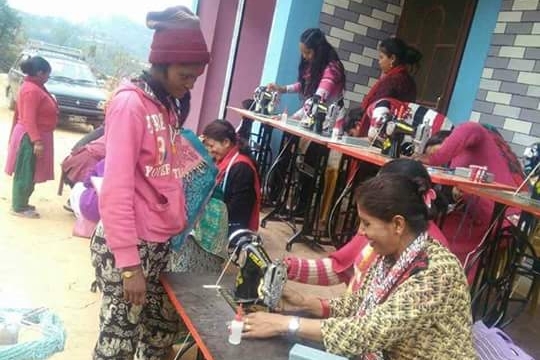 WE look to be taking 10-15 lucky tourists with us this time and 5% of our profits will go to support Arnakot Deurali Village projects and we will undoubtedly visit Tara again at Chetana Womens skills development to purchase over $1000 worth of goods to sell for her in Australia. We'd love to have you join us, or donate towards providing an education for Arnakot Deurali children. Sponsorship for a Childs whole education is about $300 per year. 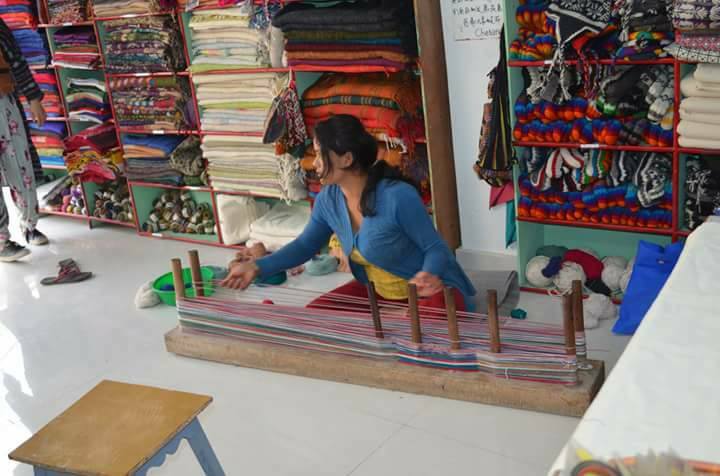 Or perhaps you'd like to sponsor Tara to teach more weaving to women providing much needed income to Nepali Women. We will provide pics and updates of how your funds are spent. Yesterday I had a lovely visit with Tara Timilshina from Chetana womens skills project. Did you know that she has up to now trained 270 women in remote villages how to weave, sew and has donated sewing machines and cotton too. Then she buys their finished products and makes beautiful bags whilst empowering more women onsite in her shop. Tara relies on sponsorship to do this and sometimes has to contribute her own funds too. She believes that the best way to help Nepal is to share skills and empower people... she is amazing. She has just signed a 10 year contract for her store and hopes to help many more women. 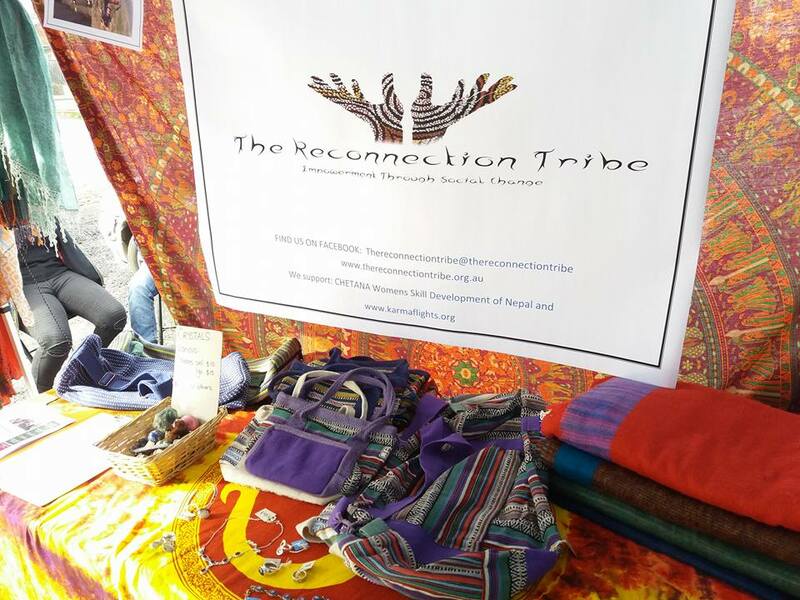 If you would like to help support the amazing work she does please buy her bags and products from our soon to be released online shop or pledge sponsorship for her to visit another village and train more women. Or visit us and volunteer with the women and learn some weaving yourself. Together Tara and i are planning to visit a remote village that makes hemp cotton. Tara with women she had trained. Teaching with the sewing machine. Collected from Yarra ranges Special Development school and other people connected to Warramate lodge in Seville. 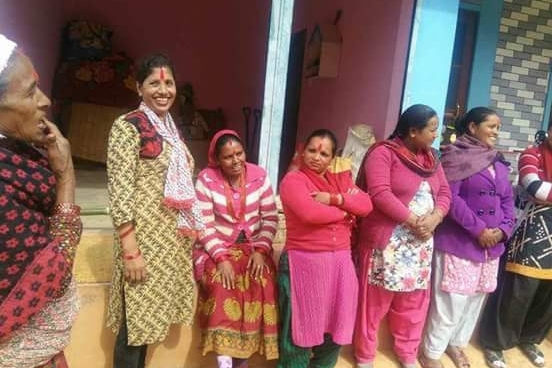 To go towards projects in Arnakot Deurali that benefit the children.